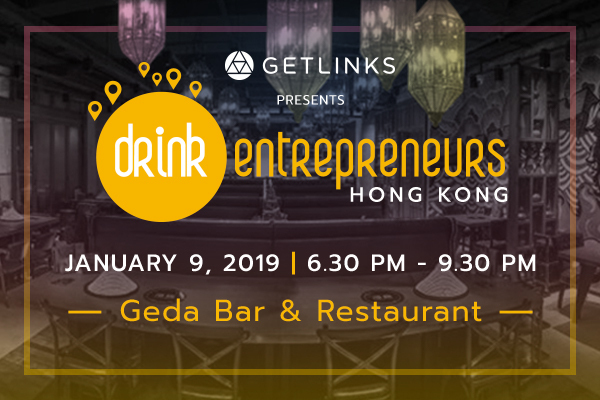 GetLinks is proud to be hosting another DrinkEntrepreneurs event in Hong Kong! At DrinkEntrepreneurs, we believe life is about making great human connections. Join us in the Geda Bar and Restaurant on January 9th. Relax, interact, have a drink or two and expand your business network! DrinkEntrepreneurs is a non-profit organization connecting the local business ecosystem in major cities. It’s a place for entrepreneurs, C-levels and entrepreneur circles (Investor / Coder / Designers / Media etc.) to gather around a drink. Our afterworks are connecting a global network of 40+ cities around the world from Silicon Valley to Europe and Asia. GetLinks is a platform and ecosystem connecting tech talents to opportunities across Asia. We support people to build their skills, connections, teams and careers.